More than 900 people in the country music industry – including radio personalities, artists, executives, label representatives and media – are gathered in Memphis this weekend for special performances and industry-insider events to celebrate the 30th anniversary of the Country Cares for St. Jude Kids® radio program. In celebration of this historic fundraising landmark, and in recognition of his steadfast commitment to the St. Jude mission, St. Jude Children's Research Hospital has presented Randy Owen and his family with the dedication of a patient family room. Owen has lead the charge to establish St. Jude as the charity of choice for the country music industry through his 30-year dedication. Country Cares is anchored by annual radiothons, comprised of 200 radio stations who share the mission of St. Jude with their listeners through various promotions and programming methods. 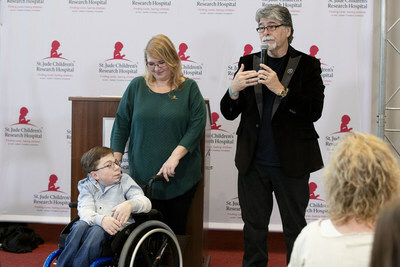 "Randy Owen has rallied the country music community like no other for 30 years to make a tremendous difference in helping St. Jude fulfill its lifesaving mission for our patients and their families," Richard Shadyac Jr., President and CEO of ALSAC, the fundraising and awareness organization for St. Jude Children's Research Hospital, said. "He is proof, like our founder Danny Thomas was, that one person can make a remarkable difference in this world. With the help of his friends in the country music industry, he was instrumental in starting the Country Cares for St. Jude Kids program, and we are forever indebted to Randy and his family for their years of generosity." Country Cares for St. Jude Kids was born in 1989 when Randy Owen addressed the Country Radio Seminar in Danny Thomas' place, asking his friends in the industry to make a difference. Now in 2019, more than 200 radio stations around the country take part in the program and musicians like Randy Owen are serving as mentors for up-and-coming artists to work with St. Jude. Artists who have participated include Luke Bryan, Jake Owen, Keith Urban, Thomas Rhett, Brad Paisley, Hunter Hayes, Kelsea Ballerini, Brett Eldredge, Florida Georgia Line, Darius Rucker, Tim McGraw, Lady Antebellum, Justin Moore, Big & Rich and many more. "The most important thing I'll ever do, apart from being a father and a husband, is helping children at St. Jude," Country Music Hall of Famer and Alabama lead singer Randy Owen, said. "Over the past 30 years, I've watched children at St. Jude grow up to be happy, healthy adults. This room dedication shows that the country music industry has made a true impact, and I'm glad I could be part of that." Following the Country Cares format, St. Jude radio programs now reach beyond country music – including gospel, rock and Hispanic platforms. Because of programs like these, families at St. Jude never receive a bill for treatment, travel, housing or food – because all a family should worry about is helping their child live.